Kauai 2 BR/2 BA Condominium Oceanfront - Pono Kai Resort! Enjoy beautiful sunrises and all the luxuries that accompany beach side living. 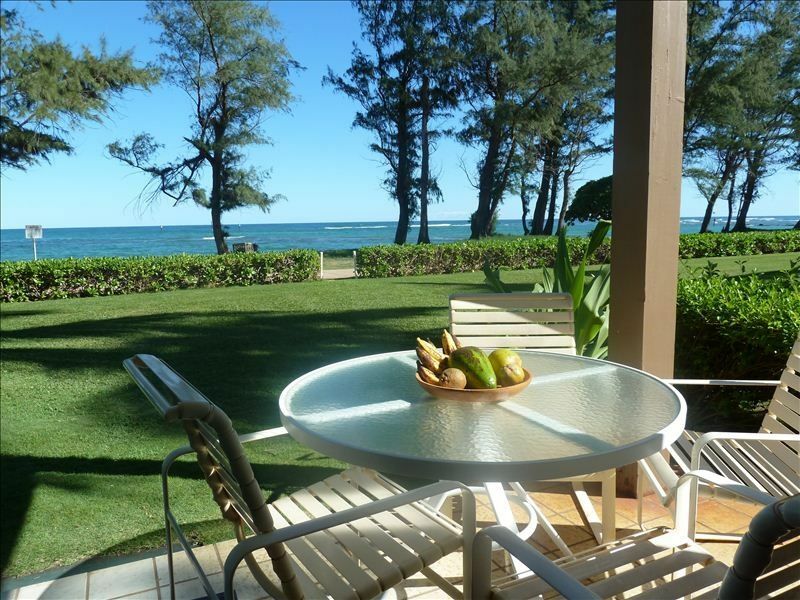 This two-bedroom ground floor condominium in Pono Kai is steps from a mile-long, sandy beach. This beautiful condominium has been privately owned, cared for, and enjoyed by us for nine years. We take pride in the quality and decor of our island home. The two bedroom, two bath condominium comfortably sleeps two to six people. The master bedroom has a king-size bed, the second bedroom has two twin beds, and a queen-size sleeper sofa is in the living room. It is well equipped with dishes, pans, dishwasher, microwave, air conditioning, and cable TV. Laundry facilities are available in the complex. See rate and availability information below. A deposit of $150 to reserve your dates is required. Call or e-mail for information on availability and island activities.